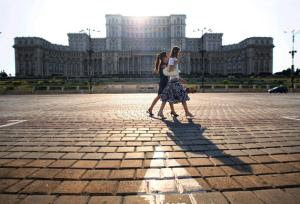 The Soviet-era monoliths are still there, but as Romania’s capital reaches its 550th birthday, Ian McCurrach finds that such words as ‘hip’ and ‘trendy’ are not out of place. With the Romanian leu still in freefall, your pound will stretch much further, making Bucharest a very attractive choice for a city break this spring. This year the city celebrates its 550th anniversary with an enticing programme of arts events. Next month, from 7 to 13 May, Bucharest will host the annual EuropaFest (jmevents.ro), Romania’s international music festival which features a series of concerts by top jazz, blues and pop bands and classical musicians drawn from 45 countries around the globe. Romania’s gay pride festival, GayFest (accept-romania.ro), is coming up too, from 18 to 24 May. Alongside the central parade, this year there will be theatre performances, film screenings, exhibitions, parties and seminars. The city’s Belle Epoque buildings, wide, tree-lined boulevards and its reputation for the high life had earned it the tag „Little Paris” by the 1930s. It even has its Arc de Triumf, dating to 1878. During the Ceausescu years, when large parts of the city were bulldozed to make way for concrete, Soviet-style monoliths, the historic quarter was ignored and, as a result, it fell into quite spectacular disrepair. This is something the city is currently trying to undo with extensive restoration programmes. In the run-up to the city’s anniversary, Bucharest has undergone something of a makeover. Many of the buildings in the historic quarter are already home to trendy restaurants, bars and clubs providing the capital’s lively student base with an atmospheric centre for arts and entertainment. It may be just settling into its role as a new EU capital, but this big, bustling city is brimming with confidence. The monolithic Parliament Palace (cdep.ro) – the second largest building in the world after the Pentagon – which was built during the Ceausescu regime. It has 365,000 square metres of floor space divided between 440 offices and 2,000 rooms. The interior is full of grand staircases, marble-plated ballrooms and huge crystal chandeliers. Tours run on the hour daily from 10am. The National Art Museum (mnar.arts.ro). Housed inside the magnificent former Royal Palace dating from 1812, this is Romania’s largest and most impressive art collection. There are three permanent exhibitions, the highlight of which is the Gallery of Romanian Medieval Art featuring frescos, icons and carved altars.